Mickey Gall will get his wish, as the Ultimate Fighting Championship has put together a thrilling matchup between Diego Sanchez and Gall at UFC 235 in March. After smashing a couple of overhyped chumps, Gall is taking a step up in competition for his next fight. Mickey Gall has established himself as something of a prospect killer, depending on whether you ever really believed Sage Northcutt and CM Punk were actual legit prospects. Either way, he strangled both Northcutt and Punk with ease, killing their hype dead. Now he’s set to take a step up in competition with his next opponent, fellow ‘Dana White’s Lookin’ For A Fight’ recruit Randy Brown. The two will throw down at the massive UFC 217 show being held in Madison Square Garden on November 4th. While Brown hasn’t generated the headlines Gall has, he actually has way more experience. He’s a former Ring of Combat champ with a 9-2 record and is already five fights into his UFC career. Gall’s only pro fight before being signed to the UFC was his Lookin’ For A Fight match where he called out CM Punk. But he is 4-0 with all four wins coming via rear naked choke. Brown will be a stiff challenge for Gall, and an opportunity for Mickey to show people he’s not just a hype killer but someone who deserves some hype of his own. Check out the UFC 217 card as it stands right now. Prospect Mickey Gall will make his fourth Octagon appearance when he faces Randy Brown at UFC 217. In December, when the UFC went to Sacramento for UFC on FOX 22, there were some unique sights to behold. There was Urijah Faber making his last walk to the Octagon in his native city. There was Michelle Waterson emerging as a star by tapping out Paige VanZant. And there was Sage Northcutt…talking trash? Northcutt (8-2) lost his main card bout against Mickey Gall that night via second-round rear-naked choke. Yet earlier in the fight, there was the wholesome Northcutt mouthing at Gall after knocking him down with a shot. That image set social media abuzz with speculation as to what he was saying. So what was it? (Hint: It wasn’t the incendiary tirade some had hoped). Northcutt’s G-rated conversation with Gall still might’ve been a little overzealous for the 20-year old Texas fighter, who pointed to being amped up before his fight as a contributing factor to his loss. Northcutt was making his second appearance as a welterweight in the fight, having come off of a victory over Enrique Martin at UFC 200 in July as a lightweight (a division he is undefeated in in the UFC). Still, the sight of Northcutt — who calls men “sir,” and women “ma’am” — barking in the cage at all was memorable. He said it was just him making the most of his time in the Octagon. Given that he ended up losing the bout, he was asked if he had any regrets about it just the same. It looks like Sage Northcutt has a bit of a dark side after all. The 20-year-old fighter has been all positivity and smiles throughout his UFC career, and has never really talked trash about any of his opponents even if they’re talking trash about him. But at Saturday’s UFC on FOX 22 in Sacramento, Northcutt did some trash talking of his own to his opponent Mickey Gall during their fight in the co-main event of the card. Gall, who submitted Northcutt in the second round, found Northcutt’s out of character remarks to be quite nice, and detailed to the media their verbal exchange in the octagon. “I’ll tell you this first,” Gall said at the post-fight press conference which MMA Fighting attended. “I wanted to play the bad guy a little bit for this, but there is no way you could be the nice guy with Sage. I wanted to talk to get him to engage with me a little bit, make him step out of his character and talk some crap maybe. And he didn’t the whole time, I was just like, ‘Ah, he’s such a sweet kid and he’s not going to do it.’ But it came out in the fight and you saw how the fight went down and I think that helped me. SACRAMENTO — Even as the hours wind down to their UFC on FOX 22 welterweight main-card bout, Mickey Gall can’t help but make fun of Sage Northcutt. Gall thinks Northcutt’s constant smiling and positive attitude are a front. And he doesn’t think Northcutt wouldn’t have fit in very well Gall’s hometown of New Brunswick, New Jersey. Northcutt, for his part, doesn’t exactly talk trash. But the Houston native, who is X-1 in the UFC, pointed out that Gall’s first two UFC opponents, Mike Jackson and CM Punk, weren’t exactly world-class caliber. Gall shakes off Northcutt’s concerns, predicting he’ll win the fight via finish in the second round. UFC On Fox 22: Has Mickey Gall Bitten Off More Than He Can Chew Or Will He Run Through Sage Northcutt? And the hits just keep on coming as the UFC sets up for yet another event this Saturday night as Paige Vanzant clashes with former Invicta atomweight champion Michelle Waterson. But before these two women meet head to head we’ll get to see Mickey Gall get his wish to face off against the natural lightweight Sage Northcutt in a welterweight match up. It’s a fight that has generated enough interest for it to be genuinely appealing, especially considering how early each of these young men are in their career. Will Gall’s callout prove to be the wise move or has he bit off more than he can chew against Northcutt? From what I’ve gathered from Mickey Gall so far in his career is that he has solid striking with an affinity for grappling. As far as his stand up goes we only have a handful of examples both in which featured the young upstart battling men with little experience. We got to see his grappling game as he faced off against the inexperienced CM Punk back at UFC 203. The fight may have done more to answer questions about the former WWE wrestler than it did to measure Gall’s potential in the UFC. Being the longer, bigger man, Gall will most likely aim to get this fight to the ground as soon as possible rather than play around on the feet. Expect him to follow a similar game plan to what we saw in the CM Punk fight. Gall will throw some strikes and feints on the feet in order for Northcutt to counter and over compensate. Once that happens expect for Gall to shoot for a double leg takedown. From what we’ve seen from Sage Northcutt this far in his MMA career, there’s a lot to like. He can wrestle, he can grapple, but he does much of his best work on the feet. What he’s missing is technical savvy. At times he finds himself too far forward against opponents who are obliged to take the karate expert down once he’s in their range. Gall is likely to employ a wrestling based game so it’s going to be important for Northcutt to keep his distance in this fight. He will likely have a speed advantage which he should consistently exploit with jabs or lunge punches then shuffle out before Gall can counter with strikes or a takedown attempt. Fighting in a broken rhythm will be key to throwing Gall off of his game and maintaining a gulf in between them will only enhance Northcutt’s chances of landing devastating power punches when he feels so inclined. Both of these young men are still prospects with a ton of upside. While Northcutt has falter d against wrestlers in the past, working with welterweight champion Tyron Woodley has likely given him the preparation he needs to counter Gall effectively. Look for Sage Northcutt to pull out the victory with a second round TKO. 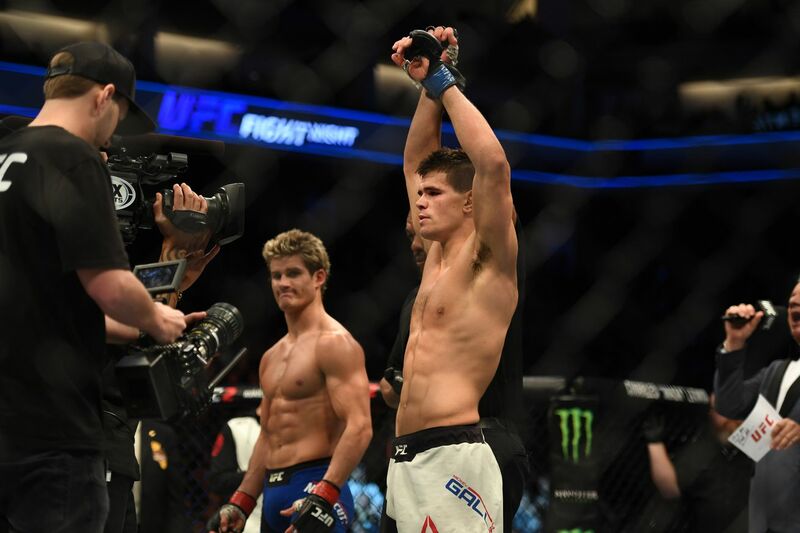 Will it be Sage Northcutt or Mickey Gall at UFC on Fox 22? The post UFC On Fox 22: Has Mickey Gall Bitten Off More Than He Can Chew Or Will He Run Through Sage Northcutt? appeared first on Cagepotato. The only thing certain about the future of CM Punk is that the former WWE superstar intends to fight again, whether it’s in the UFC or elsewhere. In recent weeks, both Punk and his coach Duke Roufus have indicated that the 38-year-old is in talks with the UFC to figure out his next move and is dead-set on ensuring his MMA career isn’t a one-and-done, even if it means moving on to a new promotion. While Punk remains a marketable commodity due to his star power, the prospect of him fighting again presents a tricky situation for the UFC, as the still-very-green ex-professional wrestler would likely be outclassed by every fighter on the UFC roster. So if the UFC elects to throw Punk against someone already under contract, Mickey Gall — the man who defeated Punk at UFC 203 — believes history will be destined to repeat itself. Punk signed with the UFC in 2014 with virtually no martial arts experience, but the idea of fighting professionally was one he toyed with for years prior to that. Punk has stated in the past that he would have happily debuted on a small show and fought his way up the regional circuit, but that once the UFC expressed interest, he would’ve been a fool to turn down the opportunity. Following nearly two years of training at Milwaukee’s Roufusport Academy, Punk finally debuted in the Octagon to great mainstream interest this past September, losing in less than three minutes via rear-naked choke at the hands of Gall. He has since returned to Roufusport to continue learning the ropes, and on a recent episode of The MMA Hour, he said that he was “pretty confident” that his next fight will be in the UFC. While Gall has moved onto bigger things — he’s slated to fight Sage Northcutt on the main card of UFC on FOX 22 — he still knows that his name will forever be linked to Punk’s, and he is conflicted about the idea of someone so inexperienced continuing to compete under the UFC umbrella.